Stale cigarette and cigar smoke odors are never pleasant. If you've had a smoky encounter, treat your clothing and home as soon as possible to regain the freshness you desire. If your washable clothes and linens are smoky, these methods work particularly well if the fabrics were exposed to the smoke for only a short time like a weekend visit. Extended exposure will take repeated treatment. Air them out. Hang the smoke infested clothing in the open air. If you can’t hang things outside, hang the clothing in a breezy, warm, and sunlit room filled with lots of green leafy plants to help absorb the odors. Use a fan to create air movement. The length of time you need to air clothes depends upon how saturated the clothing is with smoke and how sensitive you are to the odor. The length of airing can be as little as a few hours to a couple weeks. Soaking. To remove the odor, soak the clothing in a sink or washing machine filled with warm water and one cup baking soda before washing. Overnight is usually sufficient. Washing. After soaking, wash according to the garment care label instructions using unscented laundry detergent. Add one cup of distilled white vinegar to the rinse cycle and stop the cycle. Let the laundry soak for an hour in the vinegar and water solution before completing the rinse cycle. If the clothes should be handwashed, follow your usual routine but add the distilled white vinegar to the rinse water. Drying and airing. Dry the freshly washed clothes and linens on a clothesline or clothes rack in the sunlight. The ultra-violet rays of the sunlight will help remove odors and smells; however, bright sunlight can cause dyes to fade so hang dark colors in the shade. The line drying will also provide a final opportunity for clothes to air out. If you must dry in a clothes dryer, use a low-temperature setting because excessively high heat can actually cause any remaining odor molecules to bond with the fibers. Use a fabric refresher. A fabric refresher in either scented or unscented formulas may remove odors. There are in-wash formulas as well as sprays. If spraying, spray the clothing outside and let it continue to air. Store away. You really don't want to store clothes away with any type of strong odor. But, you can place the garments in a sealed plastic tub or heavy-duty plastic bag with a box of baking soda to help remove odors. Leave the container sealed for a week or so. The baking soda will absorb the odors similar to what it does in your refrigerator. Repeat if necessary. Once through this process will effectively remove smells and irritants enough for most people. 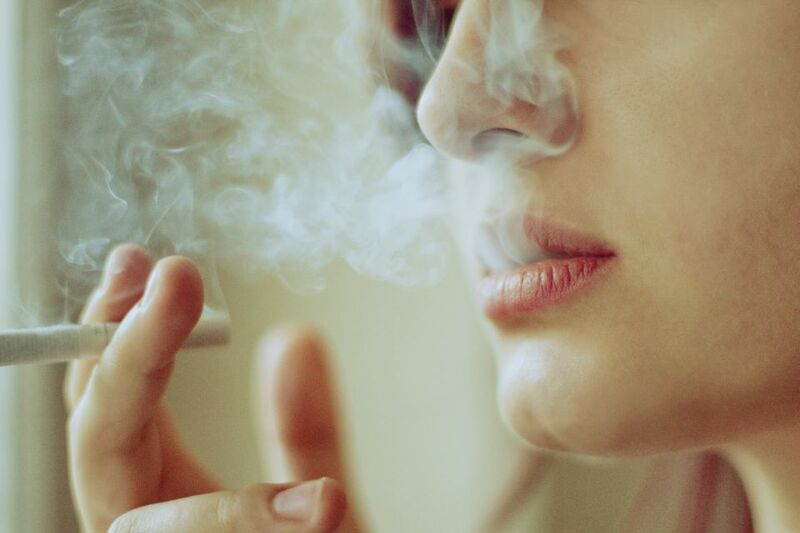 If your clothes still have bothersome cigarette odors, repeat the steps. These methods are safe for all washable fabrics. If the clothing is labeled dry clean only, follow the steps for airing the clothing outdoors or inside. If it is a garment that can be handwashed, add the baking soda soaking step and a vinegar rinse. If the item can not be handwashed, try a fabric refresher spray. The formula will trap the odor molecules and suspend them until the clothes can be properly cleaned. You can also use a home dry cleaning kit to refresh fabrics or take your garments to a professional cleaner. If you have a frequent indoor smoker in the house, it is nearly impossible to remove all of the smoke smell from carpet and upholstery. But it can be done if the smoking was brief like a weekend guest or party. As soon as possible, empty all ashtrays and dispose of the trash bags. Open as many windows as possible and turn on circulating fans to help bring in the fresh air. Pour some distilled white vinegar into small bowls or cups and place in the affected rooms. Toss any washable cushions and throws in the washer and sprinkle plain, dry baking soda on carpets and area rugs. Allow the baking soda to remain on the carpet for about an hour and then vacuum up. Be sure to toss the vacuum bags after cleaning or empty the vacuum cup. If that doesn't do the trick, repeat the steps or resort to a commercial odor remover that uses activated charcoal. For vintage upholstery, consult a professional or if you need more stain removal tips. What is the Best Way to Remove Kool-Aid or Fruit Punch Stains?